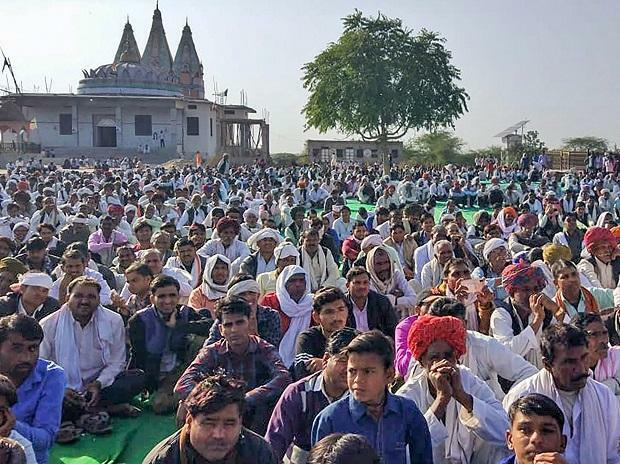 Gujjar leader Kirori Singh Bainsla and his supporters Friday began a sit-in on the rail tracks in Rajasthan's Sawai Madhopur district, forcing authorities to divert trains. The protesters are demanding five per cent reservation to Gujjars, Raika-Rebari, Gadia Luhar, Banjara and Gadaria in government jobs and educational institutions. Rajasthan Chief Minister Ashok Gehlot appealed to the people to maintain peace. Train movement was affected due to the dharna at Malarna Doongar tehsil -- around 125 km southeast of Jaipur. Seven trains were diverted in the Sawai Madhopur-Bayana section in Kota division, said Abhay Sharma, chief public relations officer of the North Western Railway. "Things are changing fast. I have not come here, but the crowd has brought me on the railway tracks. People cannot be fooled all the time. It is a fight to do or die. The state government should stand on its promise. It will be a peaceful protest. I will lead the protest and the youths will support," Bainsla, who heads the Gujjar Arakshan Sangharsh Samiti, told reporters. Additional police forces have been deployed in Bharatpur police range -- under which Sawai Madhopur falls -- to tackle any law-and-order situation. "Seventeen RAC (Rajasthan Armed Constabulary) companies, including a special task force, have been deployed in the range," Bhupendra Sahu, inspector general of Bharatpur Range, said. "Senior police officers, who have experience of working in the area, have been assigned duties. The situation is completely under control," Sahu added. Gehlot said the government was ready to hold talks. "The government is serious in resolving the issue and ready to hold talks. The Congress government had heard the issues in the previous tenure and made efforts at the state level. I appeal people to maintain peace." As the deadline lapsed on Friday, Bainsla held a 'maha panchayat' at Malarna Doongar and started the sit-in.